This is my third year decorating the Kennedy Fir, and it’s one of my favorites! It is so realistic and great for a tight space, and always looks elegant displayed in our living room! Last year, I decorated my classic Kennedy Fir with blue and gold for a timeless look. For this year, I decided to go a little sparkly, or rustic glam as I like to call it. This means a lot of gold and glitter all over the tree! My gold deer heads and glass bird ornaments look elegant against the classic green needles of the tree. They also give off a woodland appeal to match the rustic theme! These glittered star, pinecones, and letter adds sparkle to the tree! I put sparkly wooden stars and glitter-covered pinecones to add glamour to the display, and included glitter-covered letters for a more personal touch. I made a black and white check ribbon bow for my tree topper! I accented the tree with white and black buffalo check (a leftover from my spring wreath), and then found some more on sale at Michael’s. So happy! My Fir ScentSicles for the tree! ScentSicles are scented ornaments that can be put on your tree. Mine is fir-infused (matches my tree), so I added a couple for a fresh scent! To give the tree a bit of height, I placed it on a crate that I found at an antique show last spring. Then, I covered it up with a yard of gray and white checked fabric from Ikea. I love sitting in front of this tree every morning with a cup of coffee, and really had fun decorating this tree for the third time! 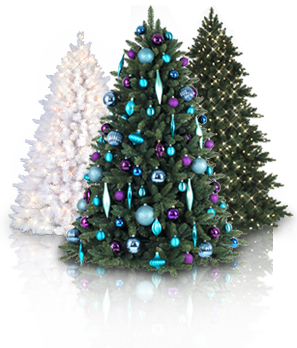 If you want more design ideas, check out this decorated flocked tree!